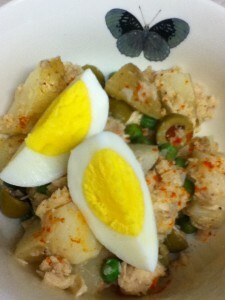 I recently discovered that Tuna & Potato Salad is a classic Spanish recipe. I should’ve guessed it, since my first taste of this salad was prepared by my Spanish boyfriend’s mother! In writing this recipe, I stayed true to the ingredients that Mama Conde typically uses. However, roasted red peppers and mayonnaise can also be added with tasty results. 1. Add potatoes to a pot of salted water and bring to a boil. Simmer for about 8 minutes or until just tender. Drain and rinse with cold water to cool slightly. 2. Combine the first 7 ingredients in a large bowl. Garnish with the boiled egg and paprika, as desired. *Pearls® brand has reduced the sodium content of their olives from 310mg to 70mg per 4 olive serving. Nice! Copyright © Delicious Discoveries .